Positive Psychology is a scientific field whose knowledge then translates into multiple different exercises, activities, techniques, coaching tools, and interventions that can be used with coaching clients, at work in group settings, by students, employees and anyone who wants more satisfaction and well-being in their professional and personal life. Mindfulness: “… that we hold our experience in balanced awareness, rather than ignoring our pain or exaggerating it.” Source: Neff (2011, p. 44). This specific exercise is called “A letter of self-compassion” and you’re going to start with choosing an aspect of yourself that you dislike and criticize. It may be an appearance, career, relationships, health, etc. Write in detail about how this perceived inadequacy makes you feel. What thoughts, images, emotions, or stories come up when you think about it? Next, imagine someone who is unconditionally loving, accepting, and supportive. This friend sees your strengths and opportunities for growth, including the negative aspects about you. The friend accepts and forgives, embracing you kindly just as you are. Now write a letter to yourself from the perspective of this kind friend. What does he or she say to you? How does this friend encourage and support you in taking steps to change? Let the words flow and don’t stress about structure or phrasing. After fully drafting the letter, put it aside for fifteen minutes. Then return to the letter and reread it. Let the words sink in. Feel the encouragement, support, compassion, and acceptance. Review the letter whenever you are feeling down about this aspect and remember that accepting yourself is the first step to change. Now before you grab your pen and paper, let’s go on a daily holiday, shall we? Are you living life in the fast lane? Do you feel like you lack time to actively savor and appreciate the experiences in your life? Then this exercise is for you. Research has shown that, rather than their intensity, the frequency of positive emotions and feelings is a stronger predictor of our overall level of happiness. Meaning that it’s more effective to increase the number of positive experiences than it is to intensify them. You’re going to choose a different vacation every day. For example, going for a walk, chatting with a friend, having a hot bath, watching the sunrise while sipping on a mug tea. The only limit is your imagination. Just choose something you enjoy doing. Before you actually start, remember, your daily vacation is a time to relax. So set aside your worries and fears for a while. During the daily vacation, try to be present and experience what is happening. Notice the sensations. How are you feeling? What positive emotions are you experiencing? Take a mental note of them. After your daily vacation remember to plan ahead for the next day; what will tomorrow’s daily vacation be? Feel free to look forward to it. Every day, before you go to bed, take at least five minutes to remember the positive emotions that you savored during the day, and on the weekend take 10 to 15 minutes to look at all the positive emotions of the past 7 days. How did you feel this week compared to other weeks? Are there any differences? How do you feel right now? The Best Possible Self (BPS) exercise can be used to increase optimism. The BPS requires people to envision themselves in an imaginary future in which everything has turned out in the most optimal way. Over the past years, writing about and imagining a BPS has repeatedly been demonstrated to increase people’s mood and well-being (King, 2001; Peters et al., 2010; Sheldon & Lyubomirsky, 2006). Peters et al. (2010) provided evidence that writing about and imagining a BPS can also increase optimism in terms of expecting favorable outcomes. This effect was independent of the effect on mood that was simultaneously increased by the manipulation. The BPS exercise can be used to increase optimism in terms of expecting favorable outcomes (see for instance Meevissen et al., 2011). While in most cases the exercise is used in a written form, it is also possible to ask clients to make drawings of their best possible self. The most powerful way to use the exercise is by instructing clients to visualize their best possible self on a daily basis. Set a timer or stopwatch for 10 minutes, during this time you are to think about your best possible future self and to write it down on paper. Imagine your life the way you always imagined it would be like, your best possible self. Picture that you have performed to the best of your abilities and you had achieved the things you wanted to in life. While writing, don’t worry about grammar or punctuation just focus on writing all your thoughts and emotions in an expressive way. You may want to have several sheets of paper for this exercise. Reflection: after completing the initial exercise, you must reflect on your feelings and answer. Think about the following questions: What effects did this exercise have? • Does this exercise affect you more emotionally or does it affect your current self-image? • Did it motivate or inspire you? • Does it make you want to make changes? • How did this exercise affect you overall? After a client is aware of his strengths and the way they are manifested in his or her life, the next step is to explore ways to optimize strength use. In order to optimize strength use, it is important to become aware of the potential for growth in a given context. For some strengths, there may be sufficient room and opportunities for using them more frequently and/or more intensely. For other strengths, certain limitations may prevent the strengths from being used more. The present exercise can be a valuable tool for gaining access to this information. The current exercise was developed by Matt Driver. The goal of this exercise is to create a graphical representation of the possibility for existing strengths to be used more or less. The advantage of using this approach is that a client can immediately see what strengths are used too little, or too much. In addition, this exercise offers a nice starting point for creating future plans to increase or optimize strengths use. Obviously, asking clients to indicate the extent to which they currently use a strength and the room they believe that exists for using the strength more is a very subjective estimation. Rather than providing an objective indication, the goal of this is an exercise is to create a global insight into the strengths that can be expanded in a given context (e.g. work or private life). For clients, it is nice to receive a copy of this exercise. For instance, they can use it to discuss and explore possibilities with other people that may be involved in the context at hand (e.g. their employer). After identifying the strengths of your client, it can be helpful to investigate if there is room to use the strengths more often. 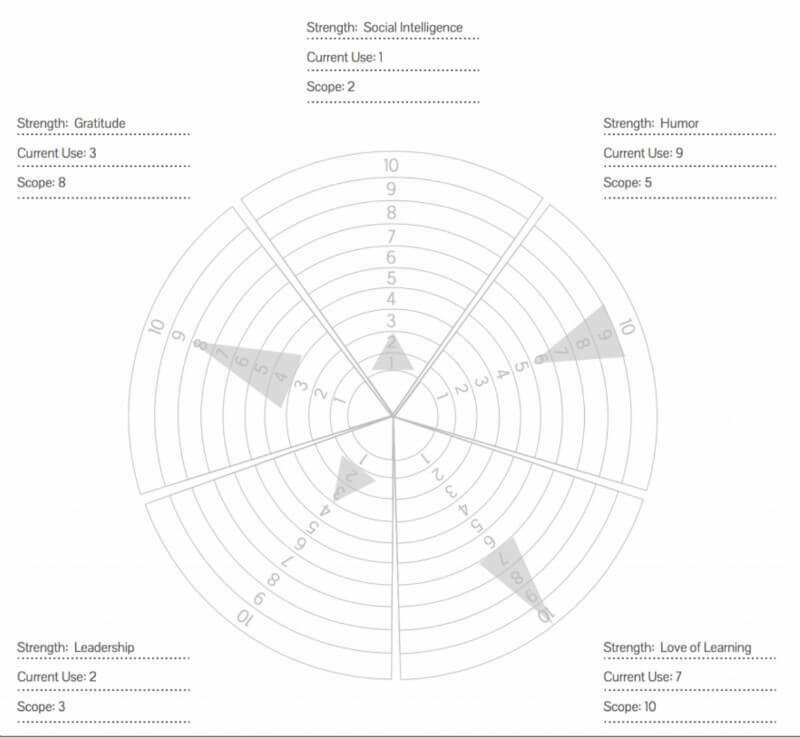 The Strengths Circle can be used to make a graphical representation of the extent to which strengths are used (current use) and the room that exists to use the strengths more (scope). The center of the circle represents a score of ‘0’ and the outer rim a score of ‘10’. How much scope there is for using that strength more in that context. Next, draw a triangle that connects the two marks. The bigger the gap between the current use and the scope, the bigger the triangle should be and the more potential there is for using that strength more. Below, you will find an example of a completed graph. In this graph, it becomes immediately obvious that the chosen context (work) is far from ideal for expressing and building the strengths of social intelligence and leadership. This is indicated by the small arrows close to the core of the circle. These arrows indicate that the current strength is not used much and that there is not much potential for growth. Often, when this pattern applies to three or more strengths, it is very likely that the current context of the client is far from ideal. For instance, from experience, I know that these patterns are often visible for clients who don’t like their jobs. It can be both an eye-opening and confronting experience for clients to plot their strengths in this way. These positive psychology techniques have been tested by many psychologists and can be used in coaching clients, at work with groups, students, employees, and our many self-taught readers who want more effective techniques to use. 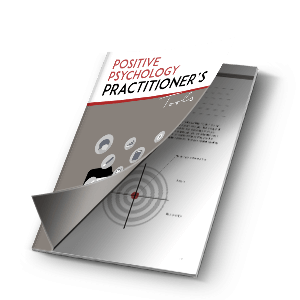 The techniques below are a little snippet of what we developed in our Positive Psychology Practitioner’s Toolkit. On this page, you’ll find a general idea of what the technique is, its goal, and how to apply it in a real setting. To access the full Toolkit with more than 100 different tools, order it here. Sometimes we get stuck in a negative cycle of feeling or thinking. Imagine you receive a bad evaluation (situation). An immediate result of this news is a feeling of sadness or frustration (feeling or emotion). Often, we automatically start thinking. Our thoughts may concern the feeling (“this is no good, I don’t want this, this must stop”) or the situation (“how could this ever happen?”) or the self (“maybe I’m just not good enough”). These thoughts can cause feelings or emotions, which can lead to thoughts again, etc. In this way, we can get caught in a cycle of thinking and feeling for a very long time. Because we are so identified with the content of our thoughts, we lose awareness of what is happening: we are caught in a game of feelings and thoughts. This is an example of how we sometimes easily get lost in worrying or ruminating (repetitive and negative thinking about the past). The exercise commonly involves the following three steps. The first step is asking oneself “Where am I?” “How am I?” “What am I thinking?” In this way, one steps outside the “doing mode” for a moment, disrupts habitual patterns and introduces awareness of the current experience. The second step involves a single focus of attention. Attention is directed away from thinking and focused on the breath. During the third and last step, attention is expanded so that it also includes awareness of body sensations. The focus here is on the body as a whole. The three-minute breathing space involves a direct way of coping, characterized by awareness and willingness to experience what is present. For many people, due to their busy schedules, spending 20 minutes lying down performing a body scan or focusing on one’s breath with the eyes closed can be quite challenging. The three-minute breathing space can be used as an effective exercise to integrate mindfulness into daily life. A structural implementation of the exercise can be achieved by using a timer at fixed moments during the day. In this way, the exercise can become automatized. Loving-kindness means tender and benevolent affection. It is the wish that all beings (you and others) may be happy and good things may come their way. Loving-kindness meditation teaches us to be a better friend to ourselves. It is a way to increase compassion. This loving-kindness meditation is a form of single-focus meditation. Just as the breath is used as a focal point in the sitting meditation, compassionate sentences in the loving-kindness meditation are the focus of our attention. The goal of loving-kindness meditation is to cultivate compassion for ourselves and others. Loving-kindness meditation has four “healing” elements: intention, attention, emotion, and connection. “Boosting” our intention (“may everyone be happy”) gives energy and meaning to our lives. The focused attention during the exercise calms our mind (“repeatedly return to the sentences”). The positive emotions which emerge contribute to our happiness and the connection we experience in silence creates a feeling of calmness and safety (feeling less alone, less scared). When you practice this meditation with clients, it is important to inform them that they should try to let go of any expectations about how they should feel during the meditation. If clients find that they are discouraging themselves by the lack of positive feelings, instruct them to be gentle towards themselves for the fact that they feel discouraged. Remind them that the aim is to focus on the wish and the intention, not on creating positive emotions. It is also important to realize that the purpose of the exercise is not to reduce or eliminate pain or suffering. This exercise teaches to adopt a gentler attitude. Obviously, it is not realistic that there will never be pain or suffering again, but you (and others) simply deserve to be happy. May I love myself as I am. May I truly be happy. May I be free of all fear. May I be free of worries, etc. Often, we automatically start thinking. Our thoughts may concern the feeling (“this is no good, I don’t want this, this must stop”) or the situation (“how could this ever happen?”) or the self (“maybe I just not good enough”). These thoughts can cause feelings or emotions, which can lead to thoughts again, etc. In this way, we can get caught in a cycle of thinking and feeling for a very long time. Because we are so identified with the content of our thoughts, we lose awareness of what is happening: we are caught in a game of feelings and thoughts. This is an example of how we sometimes easily get lost in worrying or ruminating (repetitive and negative thinking about the past). This practice can help your client to become aware of the impact of thoughts on emotions. Thoughts have the power to shape how we feel, both positively and negatively. By becoming aware of their impact on our emotions, we can learn to disrupt a negative cycle or initiate a positive spiral of thinking and feeling. Ask your client to do this exercise on a daily basis. It can be helpful to use a phone or notebook to report what is experienced in a given moment. Although it is also possible to complete the exercise at the end of the day, it is better to complete the exercise in real time, because the dynamics of the thought-feeling cycle is captured better. In order to increase self-compassion, it is important to enhance awareness of factors that prevent self-compassion. In sharp contrast with self-compassion is the harsh, self-critical inner voice that is most frequently manifested in negative, self-related thoughts (“I can‘t do anything right“, “I am an idiot“, etc.) but sometimes also expressed overtly (e.g. by telling a friend that we look like a cow in this dress). For many clients, this voice is part of daily life. For self-compassion to grow, it is important to become aware of these self-critical thoughts. For many clients, the inner critical voice has become so internalized that it has become a daily habit. Its occurrence is so automatic that many clients are not aware of its dysfunctional nature. The current exercise can help to disrupt this automatic pattern and by making clients aware of the nature of their inner critic. This exercise can help to shed more light on the things that clients are most critical of. A next step can be to transform the nature of the inner critical voice into a more self-compassionate and self-supporting one. The goal of this exercise is not to create a black and white approach to motivation in which compassion is the “good“ approach and self-criticism is the bad” approach. Rather, the goal is to make people aware of how they feel when they use self-criticism for creating motivation. A consequence of this exercise may be that the client‘s beliefs about the value of self-criticism for motivation are challenged. The client may come to realize that there are different, less self-attacking ways to enhance motivation. However, it is more powerful when a client experiences this himself than when the therapist attempts to convey this idea. Neff, K. D. (2011). Self-compassion: Stop beating yourself up and leave insecurity behind. New York: William Morrow. Past research has shown that that expressive writing about past traumatic events has many benefits for both physical and emotional health. Extensive research by James Pennebaker and colleagues shows that individuals who occasionally write about their emotions and thoughts experience several benefits: increased feelings of well-being, reduced physician visits, reduced absenteeism from work, improved academic grades, and enhanced immune system functions (Lepore & Smyth, 2002; Pennebaker, 1997, 2004). The goal of this exercise is to help clients find meaning and resolution in their trauma. 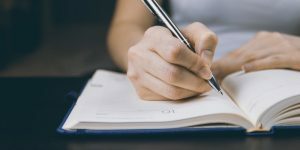 Through the writing process, clients may experience their emotional reactions to the trauma more manageable and might be less disturbed by unwarranted ruminations. Many clients are hesitant to write for fear of others discovering and reading their journal. You can inform clients to feel free to dispose of their writings after they have written the day’s entry. No one need ever see they have written. The process of self-expression is beneficial even if the text is immediately destroyed. Typically, this exercise is done for four consecutive days. However, a client may wish to proceed for a longer period of time. In any case, it is important to reflect on the experience. You can ask your client to reflect privately or/and during the coaching sessions. The questions listed at the bottom of the exercise can help to guide the reflection. Lepore, S. J., & Smyth, J. M. (Eds.). (2002). The writing cure: How expressive writing promotes health and emotional well-being. Washington, DC: American Psychological Association. Pennebaker, J. W. (1997). Opening up: The healing power of expressing emotions. New York: Guilford Press. Pennebaker, J. W. (1999). Health effects of expressing emotions through writing. Biofeedback, 27, 6–9, 14. Pennebaker, J. W. (2004). Writing to heal: A guided journal for recovering from trauma and emotional upheaval. Oakland, CA: New Harbinger Press. As I get more and more materials I am amazed to see the riches unwrapped in it. I’m taking a positive psychology class and I’m having a hard time wrapping my head around this concept. I am from India, and whether the pp toolkit is available here? Unveiling the cycle of thoughts and emotions and three minute breathing space…are almost the same writing!! !what’s the difference between these?what’s the necessity of describing the same technique in the two pints!!!??? Thank you for writing such effective techniques of Positive Pssychology in structural way. Wow! That’s great 🙂 Thank you so much for stopping by. Thank you so much for getting in touch. You’ll find out more about the toolkit Link. Pre-ordering is possible as of today! Hello to all and especially to Seph, who makes a very good work here! How i wish my english was better to enjoy more of the information that you have here and, who nose, share some of mine (But i cant because i dont explain myself well ..
Once again, CONGRATULATIONS! This is very, very important! I love to know more tips about techniques and their benefits. So, iam not very useful for you but you are always for me! Hi Seph, could I also pre order the PP practitioner’s toolkit? How do I go about doing this? Terrific resources and so easy to use with clients. Well done! I will forward to my students in the positive psychology course I am teaching for MentorCoach. Many thanks! My pleasure, Seph. Your applications absolutely take positive psychology to the applications-lined well-being streets of our world. I particularly liked that you included a discussion of self-determination. Empowering! Thank you very much for sharing this! Forwarded to our Mapp group as well! Thank you Adele – glad you like the resource! How can i get the resource pack? Very useful reminder of some effective interventions would love to see the resource pack! Please check out my reply to Birender’s comment. The same goes for you if you’re interested!